What we naturally do when the weather turns cold and wet and we want to get the clothes of our families dry is hang our clothes inside near heaters or in laundries in an attempt to get them dry. Often we try and avoid using a clothes dryer because we think that they will add to many dollar signs to our electricity bill but do you know that you could be harming your health and actually boosting your electric bill rather than saving money. In fact researchers in the very cold and wet Scotland have completed research and they have found that hanging clothes up inside your house can be very bad for your health and the issues that they are referring to include asthma, hay fever and other allergies. But even more than that the researchers are saying that drying laundry indoors has environmental, economic and health repercussions. 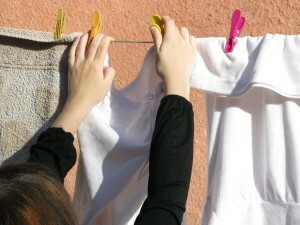 Drying clothes indoors encourages mould spores to grow and create the perfect condition for dust mites to thrive in. They also said that if the clothes being dried have been washed in fabric softener then they could release cancer-causing chemicals into the air as they dry. Often more energy is used because people tend to turn heaters up to assist with the clothes drying which adds to the fuel bill, it may be cheaper to use a clothes dryer and dry them safely and properly. The ideal situation is to dry your clothes outside rather than inside and if inside is the only option that you have because of the weather then look at using a clothes dryer as the more economical and healthier option that looks after the best interests of you and your family.